Emmet Fox is the guest speaker at the March 2015 Green Drinks Galway talk. 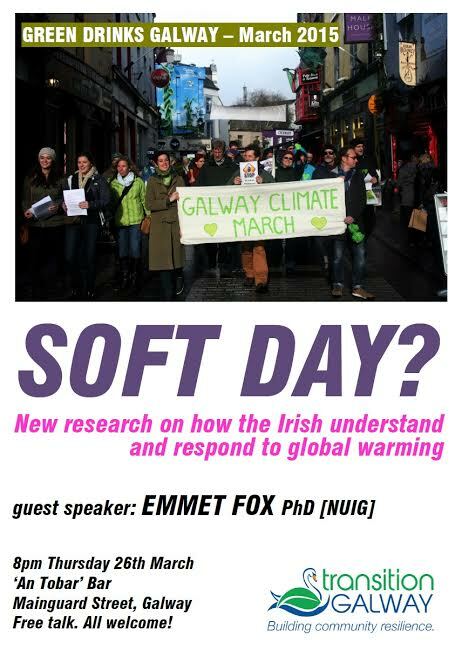 Emmet has recently completed a PhD at NUIG on public attitudes to climate change in Ireland. It will be the findings of the research for his PhD that he will speak about. The event takes place at ‘An Tobar’ Bar on Mainguard Street in Galway city centre at 8pm on Thursday 26th March. This is a free public talk and all are welcome! 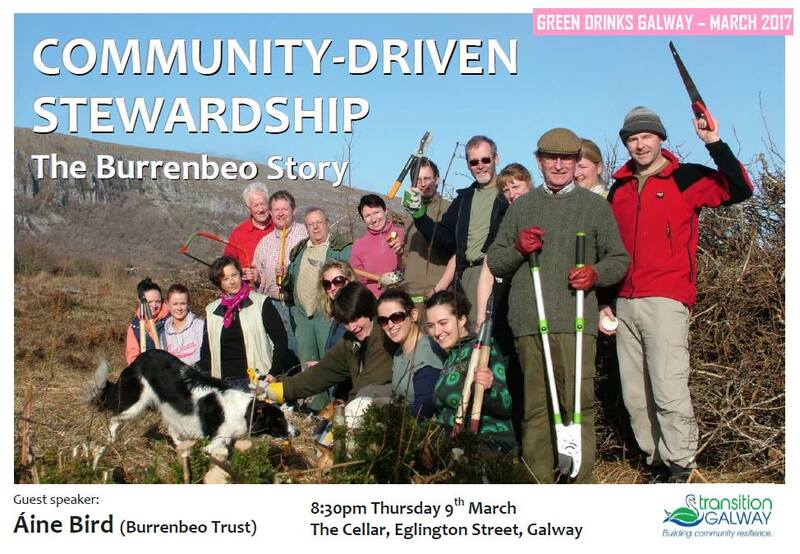 Green Drinks Galway is a regular free public talk about topics of an environmental nature. The guest speakers give a short talk and then take questions from the audience. Many people stay on for a drink or two afterwards. Tea, coffee, alcoholic and non-alcoholic drinks are available at the bar. Ian Dunne is the guest speaker at the this month’s Green Drinks Galway event which takes place at 8pm on Monday 8th December at the Cottage Bar in Lower Salthill. 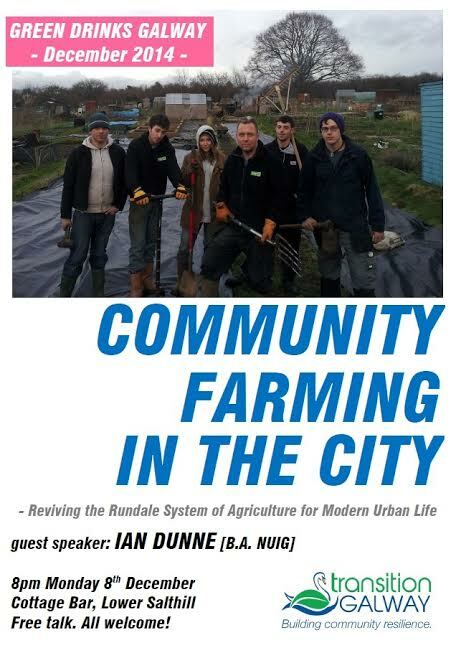 Ian will be speaking about the possibility of modifying certain aspects of a medieval system of cultivation (known as rundale agriculture) to suit the needs of modern day urban communities. After the talk, Ian will also take questions from the audience. This is a free public talk and all are welcome! Originally from the rural Co. Wexford and residing in Galway city for the last number of years, Ian Dunne is a graduate of NUI Galway with a B.A. degree in Archaeology and English. His main areas of focus are medieval and 19th century Ireland. Projects to date include an undergraduate dissertation on eviction and emigration in 19th century Ireland, and fieldwork in the Burren on the archaeology of deserted famine settlements. Wayne Jones is the guest speaker at the second November Green Drinks Galway event which takes place at 8pm this Monday 24th November at the Cottage Bar in Lower Salthill. 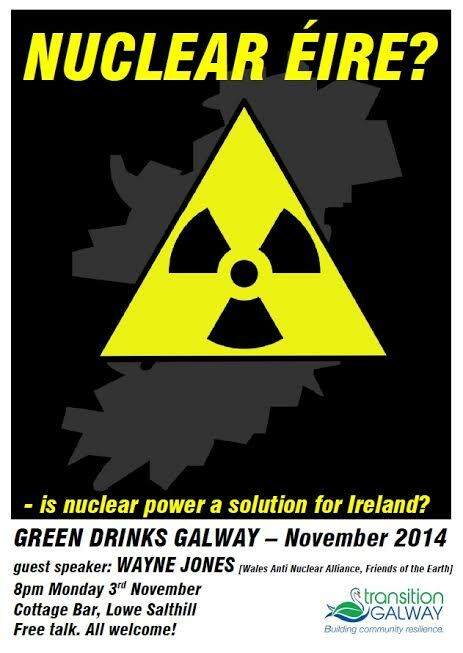 His talk will deal with the chances of a nuclear energy program in Ireland and with nuclear waste issues. The talks will also include a brief film on the current Welsh anti-nuclear campaign. Wayne will also take questions from the audience. All are welcome! Wayne Jones was born in Gwent, Wales and has worked as a reseacher for the Wales Anti-Nuclear Alliance (1984-1999). He has an interest in emergency planning in the nuclear industry (risks of meltdown etc.). Wayne has also been a countryside, agriculture and energy campaigner with Friends of the Earth UK. Galwayman Joe Kelly is the guest speaker for the November Green Drinks Galway event which takes place at 8pm on Monday 3rd November at the Cottage Bar in Lower Salthill. Joe will give a short presentation on his own ideas for an alternative light rail system for Galway city and then take questions from the audience. 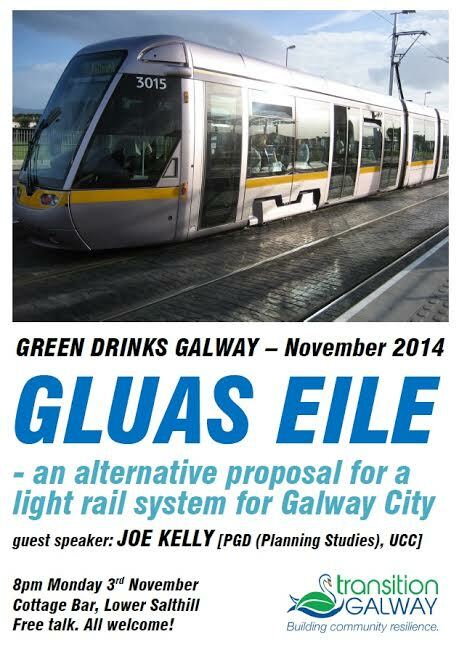 The talk’s title ‘Gluas Eile’ means ‘another Gluas’, Gluas (Galway Luas) being the original proposal for a light rail system for Galway. All welcome! Born in Mervue in 1980 and reared in Baile Chláir for most of his life, Joe Kelly has a degree in business from the University of Limerick and a Post Graduate Diploma in Geography (Planning Studies) from UCC. He has been working on proposals for light rail systems for Galway and Limerick cities since 2012. He has produced online videos outlining some of his proposals including a light rail system for Galway (http://www.youtube.com/watch?v=2lpzca5Cx58). 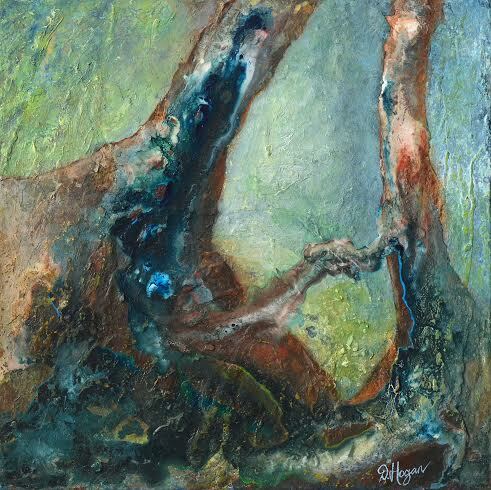 Award-winning artist Denise Hogan will be the guest speaker for the October 2014 Green Drinks Galway event. This free public talk will take place in the Cottage Bar, Lower Salthill at 8pm on Wednesday 22nd October. Denise will discuss the works from her latest exhibition ‘Think it Right’ currently on show in Renzo Café, Eyre St. Galway until 2nd November. Inspired by the works of great environmental activists such as Dr. Vandana Shiva and David Suzuki the artist will explain her process and the meaning behind her invitation to the viewer to ‘Think it Right’ (www.denisehogan.ie). All are welcome! 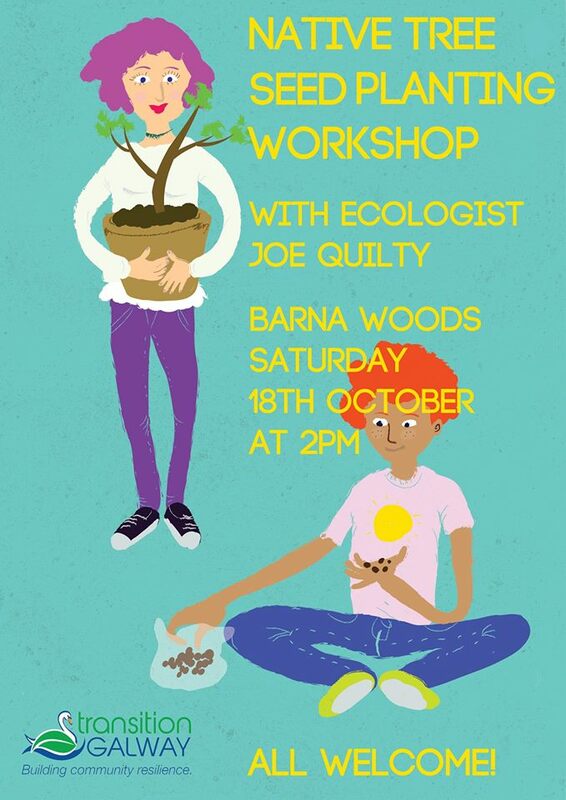 Transition Galway are hosting a native tree seed planting workshop on Saturday 18th October at Barna Woods starting at 2pm. Those attending will learn how to collect different types of seeds and how to germinate and successfully grow trees from seed. Instruction will also be given as to where best to plant various types of trees allowing for soil types and wind conditions. The group are meeting in the Barna Woods car park at 2pm. The workshop is free and everyone is welcome to come along. The workshop is being led by ecologist Joe Quilty. Joe has been heavily involved with Irish tree organisation ‘Crann’ over the years (www.crann.ie). He is also an experiential ecologist which involves helping people connect with themselves, with nature and with other people. 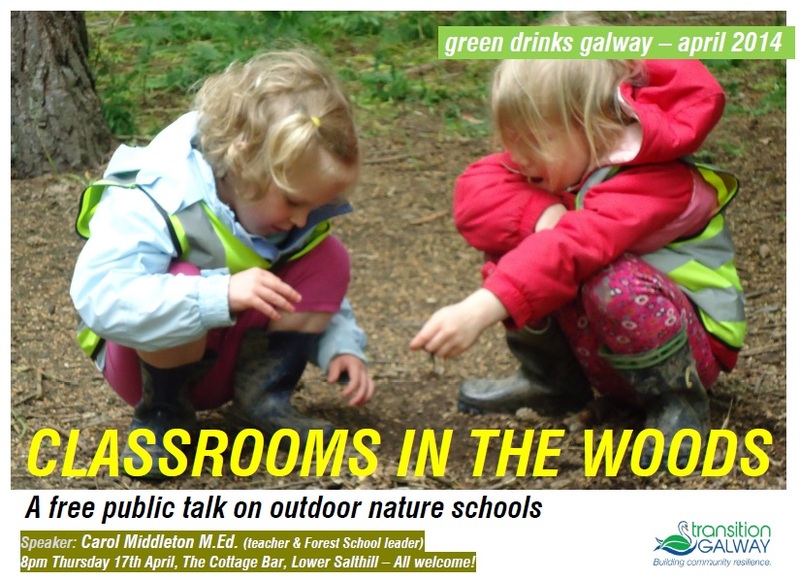 This talk is in advance of a series of courses for adults working with/supporting people who would benefit from Forest Schools and interested in Forest Schools training at Brigit’s Garden, Rosscahill, Galway: 6th -11th July and 21st – 23rd Nov 2014. To give people an idea of what to expect, there will be two taster sessions for these courses before the Green Drinks event today 2pm – 4pm AND 5.30 – 6.30pm @ River Corrib, NUIG side, directly opposite Menlo Castle. Places are limited. To book yours contact taster@huathe.co.uk Donations are welcome to cover costs. Forest Schools are based on outdoor nature schools in Denmark, where children play and learn outdoors. When children learn outdoors they develop in lots of ways simultaneously and the learning they do is very secure. Minds, bodies and hearts are all exercised at once. These principles work equally well with adults too. Carol Middleton lives in a small town on the east coast of the UK – a great place for seabirds and small boats. Carol is a qualified teacher, Early Years Professional and Forest School leader, with over twenty years of experience working with people of all ages. Her M.Ed work involved studies of children’s play and management dynamics. She has facilitated training programmes for a number of years and now works as a Early Years lecturer, group leader and facilitator in outdoor work and nature connection. Her inspiration comes from childhood summer holidays in the mountains of North Wales, the work of Jon Young and person centred approaches to experiential learning. Her passion is to get people back outside to appreciate and care for the world they live in. http://huathe.co.uk/Hope to see you there! For our upcoming Green Drinks, we have a very special guest speaker in Mark Boyle. Mark is the author of ‘Moneyless Man: A Year of Freeconomic Living’, and will be speaking about living without money, gift economics, ecological living. He will also be talking about his latest, and free(! ), book ‘The Moneyless Manifesto’. The talk takes place at 8pm at the Cottage Bar, Lower Salthill on Thursday, 9th January. All are welcome to attend. 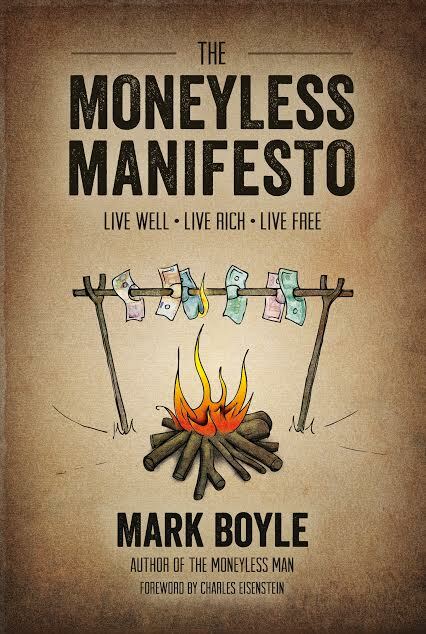 Mark Boyle has lived completely without money in England for two and a half years, an experience which formed the basis for his first book, ‘The Moneyless Man’. He is also the founder of ‘Freeconomy’, an alternative economy with local groups across 171 countries. He gives talks internationally (but doesn’t fly which makes it difficult for him to go very far very often!) and writes intermittently for various international newspapers and magazines, such as ‘The Guardian’ and ‘Permaculture Magazine’. 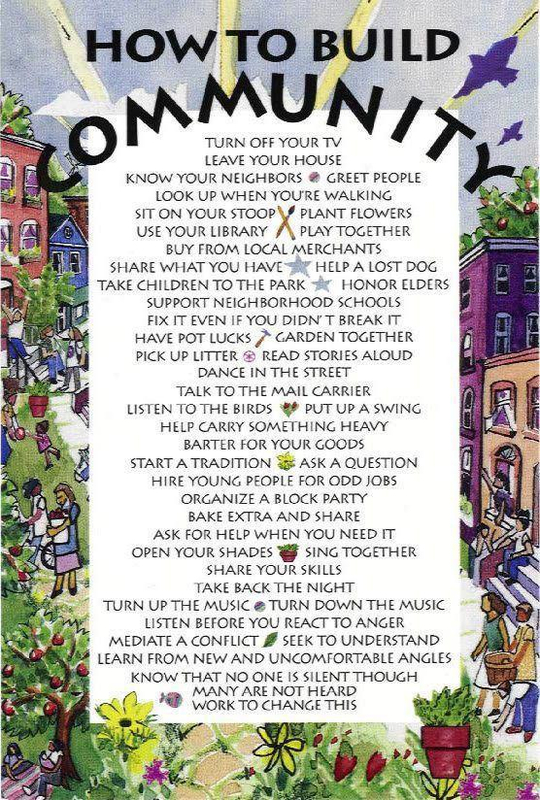 He is currently in the process of creating a fully localised, land-based gift economy in Éire which will demonstrate how all the ideas and practical solutions described in ‘The Moneyless Manifesto’ can be integrated into one holistic system design. “The revolution before us is only worth joining if it goes to the depths that Mark has explored . . . it is my hope that this book will deepen its readers’ belief in the possibility of such a world”.